Ponyo is the latest Studio Ghibli film to have been taken over and released by Disney and it is now out on DVD and Blu-ray. I did not get a chance to see it while it was out in theaters, but luckily I found a copy for review at my doorstep not too long ago. Of course I still don't have a Blu-ray player, wasn't able to check out any of the special features. The DVD only had one bonus feature (even though on the menu it said "Bonus Features", plural), though it was a good little making-of featurette. The movie itself was, like most Studio Ghibli films, very well done. The art and animation were simply beautiful, with lots of colors and strange creatures and detail so that even periods where there was no talking are interesting and enjoyable to watch. The voice actors are all famous people that we've seen in other movies, but honestly except for Liam Nison I didn't recognize them just from their voices. The acting was spot on and the voices felt like they matched their characters perfectly. Sosuke is the 5 year old boy that finds this weird little creature whom he thinks is a goldfish but is actually the daughter of a magical alchemist named Fujimoto that lives under the ocean. So Sosuke puts it in a little plastic bucket filled with water, names it Ponyo, and brings it to school with him, though hides it in the bushes outside so his teacher doesn't freak out. It doesn't take too long for Ponyo's father to recover his daughter, but by the time he does it is already too late, Sosuke loves his new friend, and Ponyo loves him back. And thus her desire to become human starts a metamorphosis whereby she makes herself grow arms and legs, and then escapes from her father once again, only this time doing so causes a big commotion and spilt magic elixirs, and that leads to a huge storm and lots of new sea creatures. While before nature was portrayed and nice, sweet and calm, now it becomes fierce and angry, almost like the villain, except that this movie really has no villain, which in itself it pretty remarkable. Enter The Lands - Meet the characters and hear the story of the movie. Behind The Studio - Discover the film's inspiration through documentaries, including all-new interviews with Hayao Miyazaki. I'd also be able to see a storyboard presentation of the movie, but I've seen those before and they tend to be kinda dull so I don't think that's any real big loss. I'll take the finished movie thank you very much, especially when it's something enjoyable like this one. And it's truly enjoyable for all ages, from young kids to adults. 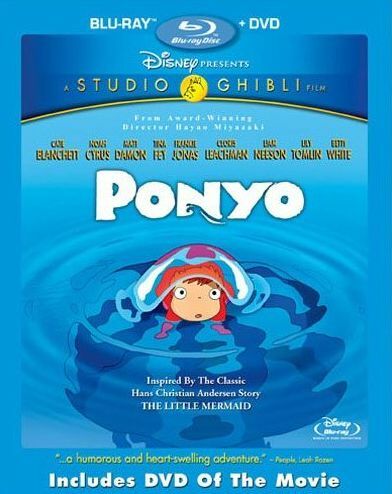 Ponyo (Two-Disc Blu-ray/DVD Combo) , released by Walt Disney Video, is available starting March 2, 2010.